the need to mark data so that different categories of information (knowledge) in the EHR are distinguished, even when their structural form is the same, e.g. a target BP versus an actual BP measurement. This is a major requirement for clinically safe querying. two mentions of a physical injury to the same location refer to the same injury or a different one. The idea is that as initially disparate mentions of some ‘bone injury’ or some ‘Dx of throat cancer’ are curated, form part of a ‘crystallised’ ontological view of the patient’s reality, rather than a series of assertions that have to be further processed by human or other agents to determine their relationship with reality. When is a Statement ‘Reliable’? The discussion below assumes that ‘reliable’ has an objective definition – i.e. the implication is that once a statement is marked as ‘curated’ there is no longer any doubt. This is probably true very often, but is certainly not guaranteed to always be the case. Nevertheless we have to be practical. The EHR is not a philosophical debating arena, it must function as a place of evidence gathering and opinion forming in support of decisions on interventions for patients. Therefore, for our purposes here, it seems reasonable to define a ‘reliable’ statement in the health record as one on which health care professionals are actually prepared to act, i.e. commit to interventions. Something like ‘curation’ already occurs in many EHR / EMR situations today. It typically takes the form of review and adjustments made to the EHR to populate ‘managed lists’ such as medications list, problem list and so on. The activity of ‘medications reconciliation’ is one well known example. It appears that curation of the EHR more generally is needed to increase the amount of information we can consider as reliable ‘ontological’ items, rather than unreliable items. To get a handle on curation, we need to look at how it might apply across a) basic categories of information and b) how authorship affects it. The set of categories we used in openEHR is shown below. In openEHR we treated all ‘opinions’ (diagnoses, prognoses, plans, assessments, goals) as if they had been written by the healthcare professional. But clearly there are any number of these types of things that patients say (In Weed’s POMR, they are treated as the ‘subjective’ part of the encounter note). Our previous way of modelling this was to say that these are all ‘observations’ (i.e. fall into the first category above), since in openEHR we treated everything that the physician ‘saw, heard, measured’ as an observation. We can improve on this, since it’s more useful if ‘observations’ are things we can rely on as being some reasonable approximation of an element of reality (a BP or whatever). A starting point is to assume that objective observations (typically repeatably measurable) are reliable. The evidence is that this is generally true, even more so in the case of patient supplied observations. These statements fall into the ‘ontological’ pool, since they (+/- occasional errors in machines or human measuring) do represent the state of some observable aspect of the patient at a point in time. What are often known as ‘subjective’ observations in medicine are statements by the patient about symptoms and experience, e.g. reported levels of pain, experience of headaches and so on. These statements are not usually treated as being adjustable in terms of reliability, i.e. while physicians try to help patients be more precise (e.g. please state your pain on a level of 0 – 10, where 10 is the worst you have ever known), they essentially have to trust the patient’s claims as they are. In theory we would like to assume that orders are reliable, since they are formally stated, and represent a committed stance by the HCP to a course of action – one which he or she is prepared to stand by medico-legally. The well-known problem here is that recording of orders in different locations (GP, GP while on holiday, hospitals, other clinics) leads to competing medication lists in each place. Each list tends to consist of orders prescribed locally, augmented by additions of drugs that the physican adds due to questioning the patient. The results of the questions are often wrong (either categorically, in dose, or some other detail), but nevertheless are added to medication lists. The result is that numerous medication lists per patient, none of which can be completely trusted. This problem is widely recognised, and is the reason for the official ‘medications reconciliation’ processes promoted by various health authorities, e.g. NHS England & Scotland. In a similar way, it initially seems reasonable to assume that administrative information is reliable, other than the effect of clerical / data entry errors. However, it is recognised that mis-identification of patients when they present at provider locations (e.g. mixing two ‘Annette Smiths’ up; tribal names and inability to provide accurate birth dates are also common problems) is a universal problem. Therefore, a more realistic approach may be to say that identification information (at least) is unreliable until accepted by the patient or some other reviewer agent, or verified by sighting of certain kinds of proof etc. Normally we like to think that clinical opinions provided by health professionals as reliable. However, the evidence is that there is a continuum of reliability even within the clinical profession with respect to diagnoses, prognoses etc. If a clinical opinion is supplied by the patient, this would normally be treated as ‘raw’, until curated by the HCP into a reliable statement. For example a patient claim of being diabetic can be easily checked, and converted to a formal statement of diagnosis made at some earlier date. A patient claim of being allergic to some substance, unsupported by evidence may be treated as less reliable, and not promoted to curated status. The following informal classification proceeds from the original openEHR Clinical Investigator Ontology that distinguished basic categories. However, it did not take account of the raw / curated distinction, and lacked some categories shown below. It is not yet sufficiently formalised to constitute a computable ontology. 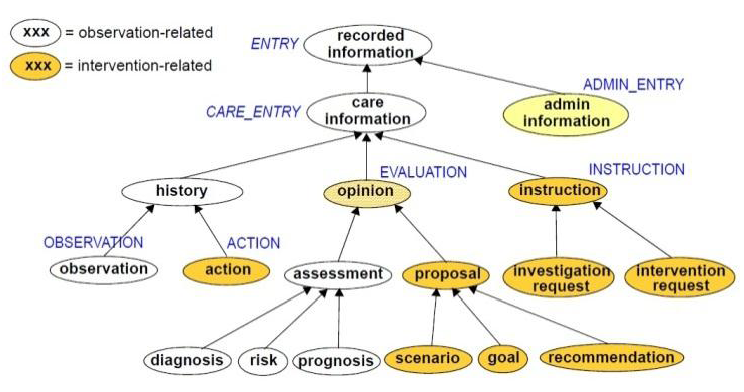 In the following, real types of clinical information are shown in bold, with candidate ontology categories shown in italics.